The next in-class exercise involved identifying problems in everyday stapler and designing a new stapler to solve those identified problems. Simple questions like who? What? Where? When? Why? How? helped to trigger the creative thinking of students. This exercise was in-line with the status of student’s Introduction to Product Design projects, providing indirect hints but also served to increase students design appreciation. The significance of the assignment didn’t end there. After going through each students identified problems and their proposed solutions, Prof. Bapat appreciated their efforts for very limited time and with calculated words. Without wasting further time Prof. Bapat showed students his huge collection of staplers. Students were amazed to see that the problems which they identified were already solved. Not only solved but solutions were sold in market in form of new products i.e. staplers. 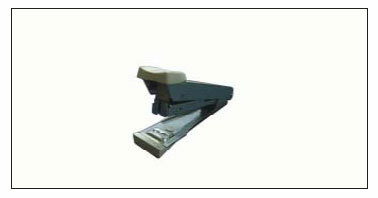 Stapler with additional pin storing facility, Stapler which can operate with minimum of efforts, stapler which can even staple a pin in the middle of A4 page, stapler for wood working, stapler for medical application, smallest stapler, stapler which can stand on its back instead of resting on its faces so that it’s easier to lift – were some of the highlights of the big collection.